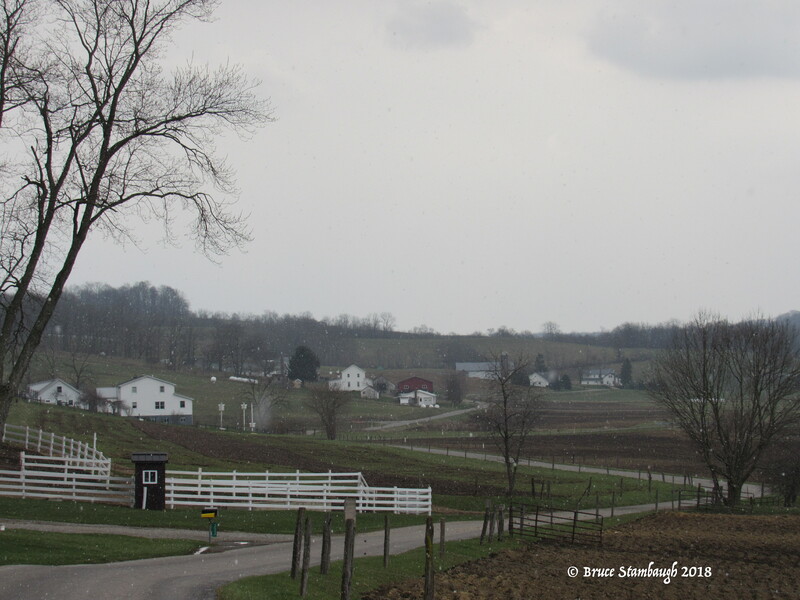 Just another snowy, grey day in April in Ohio’s Amish country. Compared to other months of the year, April is erratic when it comes to weather. It’s not that the rest of the months don’t produce variable atmospheric conditions. They do, just not as consistently as April’s predictably unpredictable weather. Our latest 10-day forecast was proof of that: Sunny, blue skies and 70-degree temperatures one day, and low 20s and snow flurries by week’s end. I’ll keep my birdbath heater going for a while. That conjecture accurately describes April’s extremes. April uses her versatile weather wand to divulge her bipolar meteorological attributes. In 30 days, the fourth month throws everything it has at us. Snow, sleet, glorious sunshine, pelting rain, lightning, tornadoes, flooding streams all are April possibilities, though not certainties. Often the host for both Easter and Passover, April’s assortment of weather takes no holidays. Recall the twin tornadoes of Palm Sunday in April 1965? Do you remember the 20 inches of snow in early April three decades ago? 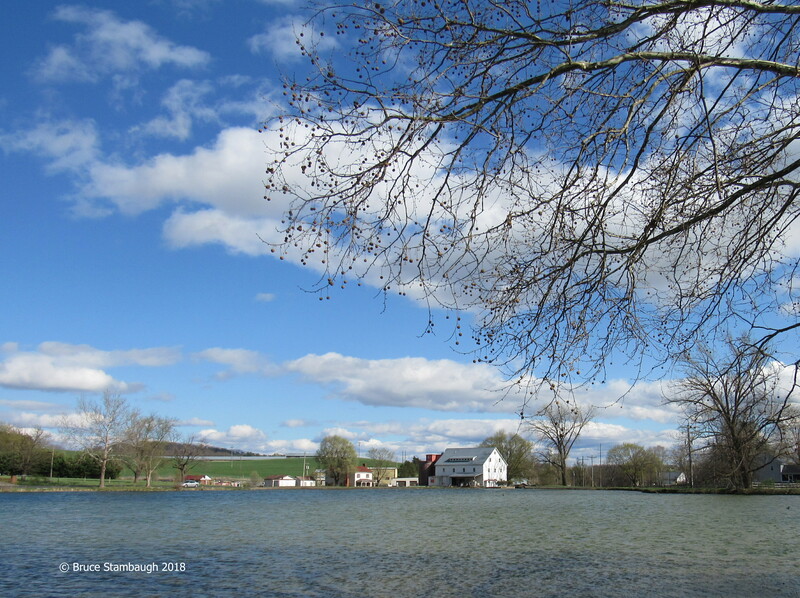 A puffy, white-cloud day in mid-April in Virginia. When April arrives, we all are more than ready for spring. That is especially true after this extended winter season that ranged far beyond its usual territory. April’s weather plays games with us, teases us, infuriates us, and beguiles us to the point of hopelessness. Nearly at the breaking point, we relent and grudgingly accept whatever she has to offer. Do we have a choice? A conciliatory attitude allows us to engage all of our senses into whatever the weather and activities are at hand. It enables us to pause long enough to enjoy the brilliance of forsythia’s yellows before the greening leaves override them. I watched an American robin mightily tug at the remnants of last year’s plant residue, lying spent and browned in the flowerbed from winter’s bitter harshness. The robin pulled the lifeless strands taut. I turned away for a second, looked back, and both the robin and the ideal nesting material were gone. Had I witnessed the natural lifecycle in action, the very hope of spring? The increasing daylight combines with the warming earth and nourishing moistures to create rapidly changing landscapes. Rembrandt meets Van Gogh. Deadened lawns seemingly turn dull green to emerald overnight. A heavy frost or soaking rain kills the temptation to even out the irregular grassy clumps posing as a front yard. First, however, winter’s gales and unwelcomed snows require leaf and limb removal before any lawn trimming. 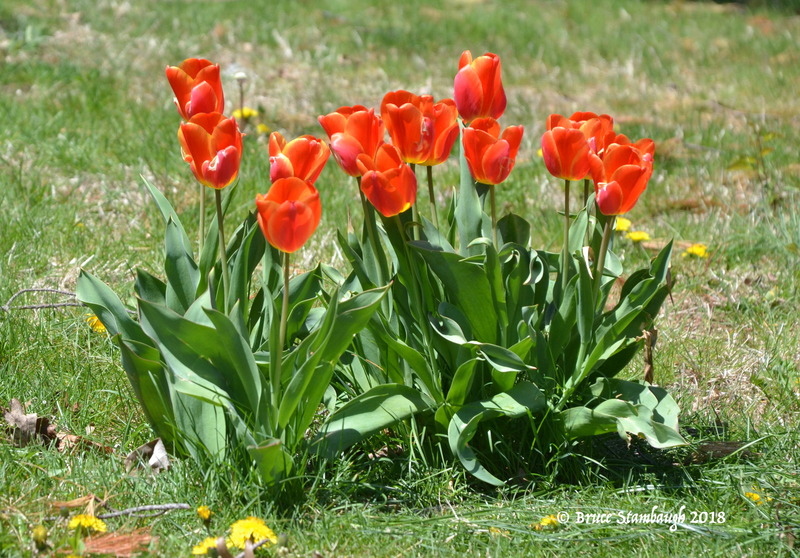 The first dandelions compete with trumpeting daffodils while the last of the crocuses yield to showy tulips. Honeybees celebrate wildly at the cherry blossoms’ coming out parties. They even gorged on the crimson buds of red maples. The little creatures are a welcome sight and the constant humming a glorious symphony, especially given their recent biological life struggles. Avid birders actually embrace April’s changeable weather. They know strong cold fronts bring more than severe storms or blinding snow squalls. Shorebirds, songbirds, and birds of prey are all on their various lists of birds to check off. They’ll brave April’s worst weather to chase a rare bird. The good news is that April’s cold, wet weather won’t last long. That’s in keeping with its role as a transition month from winter’s dormant dullness to spring’s brimming vibrancy. I’m always glad when April rolls around. From month’s beginning to end, she offers up a sampling of weather that’s sure to both please and disappoint most everyone. The challenge is to make the most of whatever comes our way. 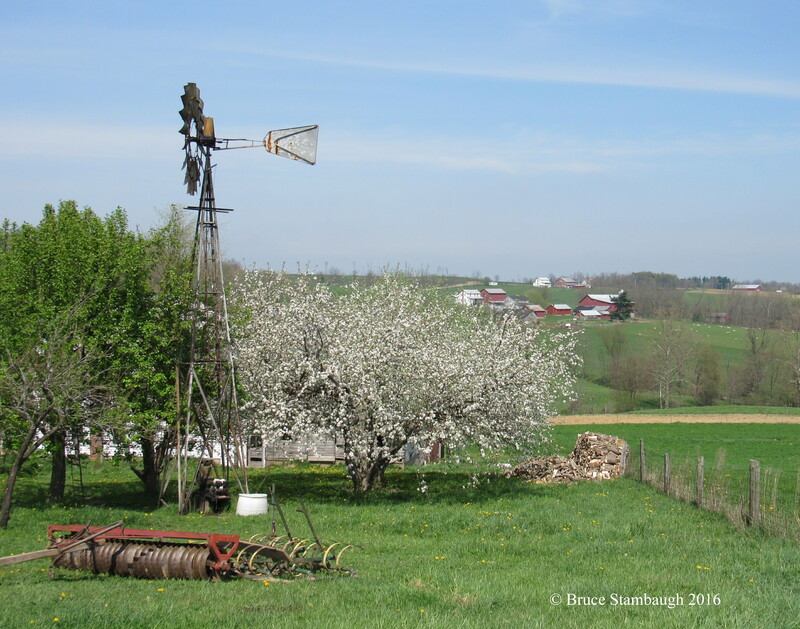 Hopefully by month’s end, pastures will have greened up, fruit trees will be in full bloom, and farmers can once again till the earth. 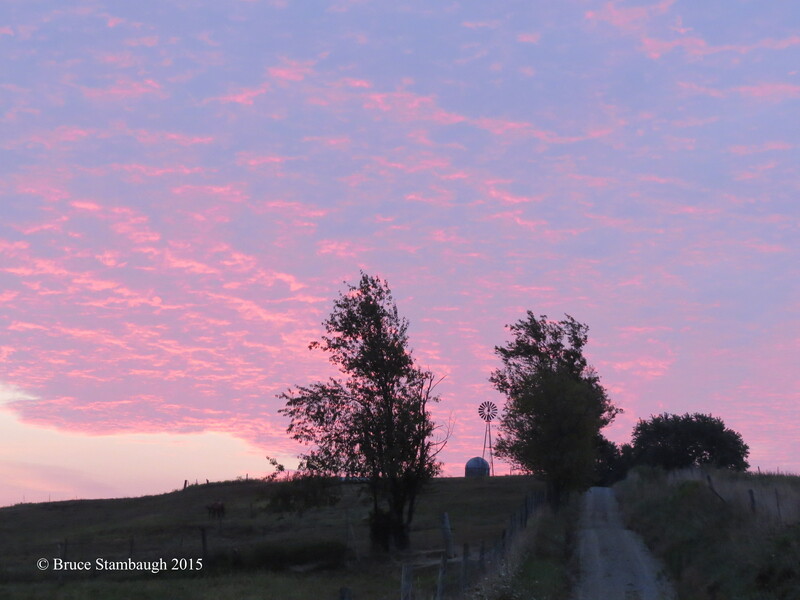 Even a peaceful scene in Amish country can become tragic. Tragedy. It’s bound to invade our lives, often when we least expect it. Too often, it happens more than once in our lifespan. Unfortunately, we likely have all seen our fair share of tragedy. Calamity merely is part of life. That doesn’t make it any easier to accept. I’ve seen and experienced a lot of tragic incidents in my life as a member of volunteer fire and rescue squads. Often I knew people involved in the emergency incidents. That’s not surprising when you live most of your life in a close-knit, rural community. Sometimes tragic national news hits close to home, too. The recent fatal shooting of Dean Beachy and his son Steve is proof of that. Naturally, people were shocked and horrified at the senseless killings. Their lives are a huge loss to the family and the many, many people they touched. My wife knew the family well, having taught Steve’s three older brothers. 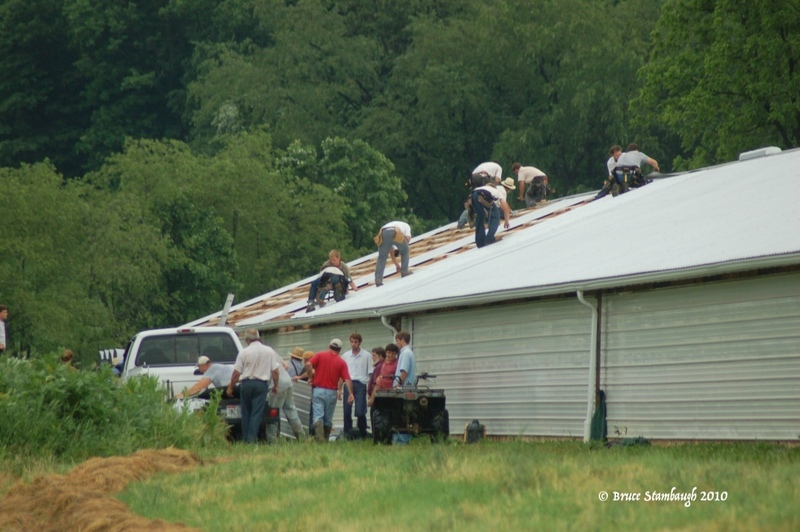 An hour after a tornado damaged this farm building, neighbors came to repair its roof. Most likely, we each could create a long list of personal tragedies that have significantly impacted our lives. Mine would have to start even before I was born. My great grandfather was killed in an auto accident involving a drunk driver. The crash critically injured my father and his only brother a block from their home. My uncle’s traumatic head injuries caused lifelong, family-wide ramifications. My mother’s father was electrocuted six months before I was born. I am sure you have a comparable list of interpersonal human misfortune. We learn life lessons from tragedies. One is when disaster strikes, people respond. That’s the way community works. What affects one family affects us all to varying degrees. My wife and I experienced and witnessed positive responses many times over our four decades of living in Holmes County, Ohio. When bad things happen to good people, others want to help. So they do. They bring food, share tears, hugs, and sit quietly with the victims’ family. Some tragedies happen suddenly, like the Beachy shootings, a traffic crash or a house fire. Others happen gradually and last over an extended time. Likely, we have all known someone diagnosed with a terminal illness. In either situation, shock, denial, anger, fear, and blame all surface in the face of loss. Often those emotions occur at different times for different family members. Heartache knows no boundaries. To be there is what really matters to the hurting individuals. As an EMT, I once responded to a drowning call at an Amish farm. The toddler was dead by the time we arrived in the country setting. Still, all the first responders wanted to do something. We comforted the grieving family as best we could. With the corner’s approval, I carried the youngster’s body to the ambulance where family, friends, and neighbors filed through saying their goodbyes. It was the Amish way, and the officials in charge wanted to respect that. Regardless of the type of tragedy, whether sudden or lengthy, no one is immune. As human beings, we can choose to offer whatever we can or to ignore the situation. Those who chose the former realize that in giving there is receiving. In caring, appreciation is returned. In listening, genuine sharing occurs. With your presence, acceptance and understanding slowly unfold. Human beings have a responsibility to one another, to be kind, to be generous, to be available, to help, to be respectful. There is no better time to express those gifts than when tragedy strikes. It’s not merely the way a community responds. It is the way a caring community thrives. 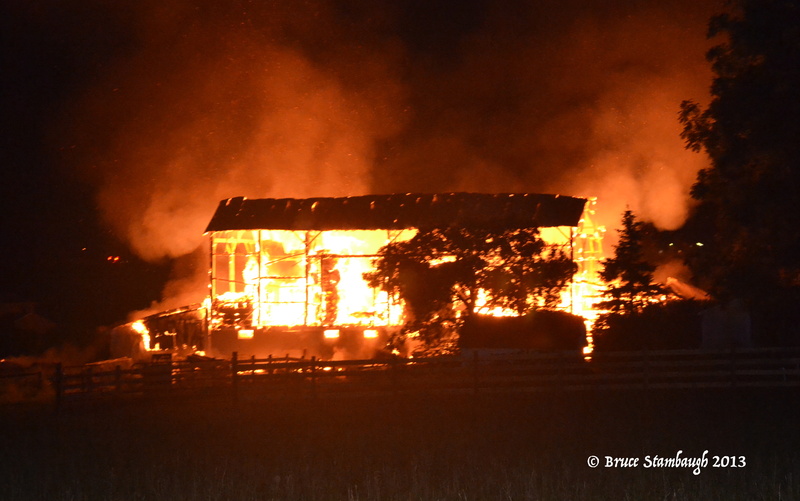 This Amish barn raising occurred less than a month after the farmer’s barn burned. 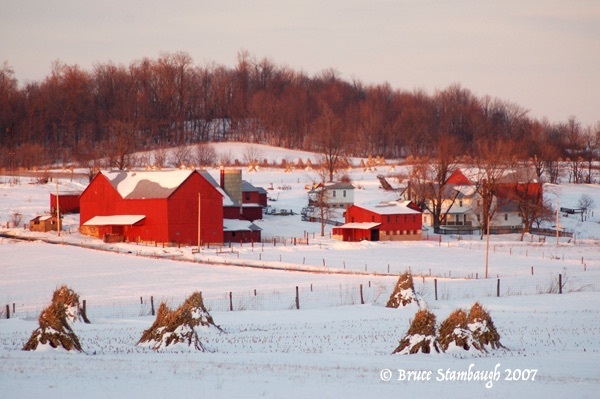 No matter where you live, winter offers a wide variety of colors across its changeable landscapes. Often, the colors transform with the weather’s latest tantrum. Given the global climate’s bipolar dysfunctions, winter’s color palette has expanded far beyond its usual earth tones and neutral hues. Wetter and warmer winters convert lawns from frosted brown to April’s greens. Living in Ohio for nearly seven decades, I intimately learned nature’s dormant color schemes. She usually painted under steely skies, which perhaps limited her range of color options. Growing up in a blue-collar suburb in northeast Ohio, my memory is filled with a canvas of white on white. We sledded down steep hillside paths beneath stately evergreens laden with inches of snow. Clumps of yellowy prairie grasses waved in the icy wind as we zoomed by shouting and laughing like the kids we were. Our wind-chapped cheeks and red noses were proof of our gold, silver, and bronze successes. Besides the fun, we relished a good snow cover that blanketed the grit and grime that most winters brought. The fluffy whiteness enlivened the quiescent landscape, the leafless trees with their non-descript brown, gray, and black trunks and branches. The pure white snow on piney coniferous bows highlighted clusters of chestnut pinecones. 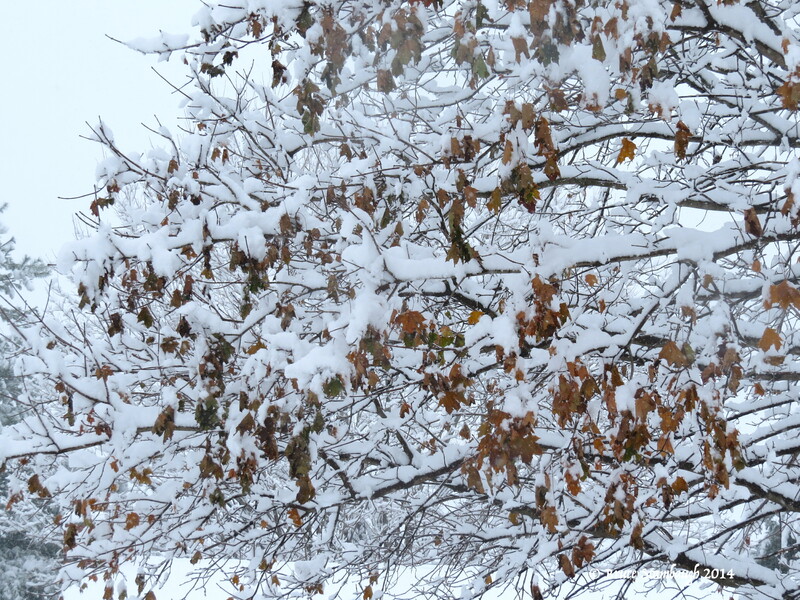 Heavy wet snow provided a stark color contrast of white on black. That all shifted in a flash when a wicked winter wind whipped nature’s artwork into layered snowdrifts crusty enough for adventuresome children to walk on. Ohio winter weather being what it is and always has been, not much changed as I grew into adulthood. Browns and whites alternated dominating the lay of the land with temperature playing the role of the artisan. 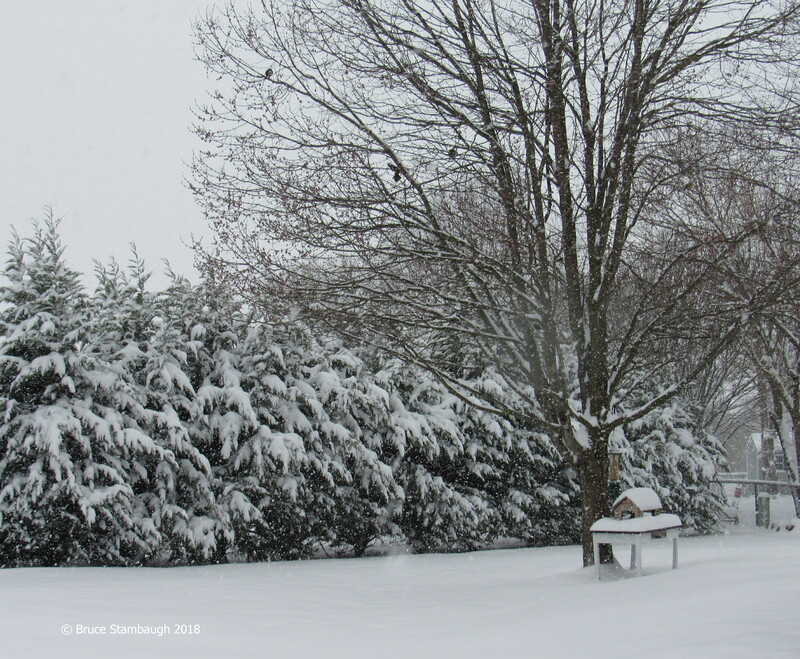 A mundane scene became a Currier and Ives gem with four inches of overnight snow. A January thaw altered all that in a hurry. The snow melted into a mushy, muddy mess, and brown soon became the primary color and texture, much to my mother’s chagrin. Usually, though, our inattentive father rightly got the blame for the sticky indoor tracks. Dealing with both the gooeyness and the frozen precipitation as an adult tendered an entirely different perspective than as a youngster. I hated how everything wore the dirt and grime of winter. That was especially true of driving a filthy automobile. Wash it one day, and it was dirty again the next. Warm, attractive colors in winter did and do exist of course. Think red holly berries against glossy green leaves powdered with fresh snow. Each new day brings opportunity. Catch a showy sunrise that may last only a few seconds before succumbing to layers of gray clouds. Sunsets are equally stunning, especially if reflected by lakes and streams, which double the orange, yellow, red, and pink pleasure. Bright colors come alive literally. Is there anything prettier than northern cardinals perched on evergreens waiting their turn at the bird feeders? If eastern bluebirds also arrive, the winter day becomes all the cheerier. 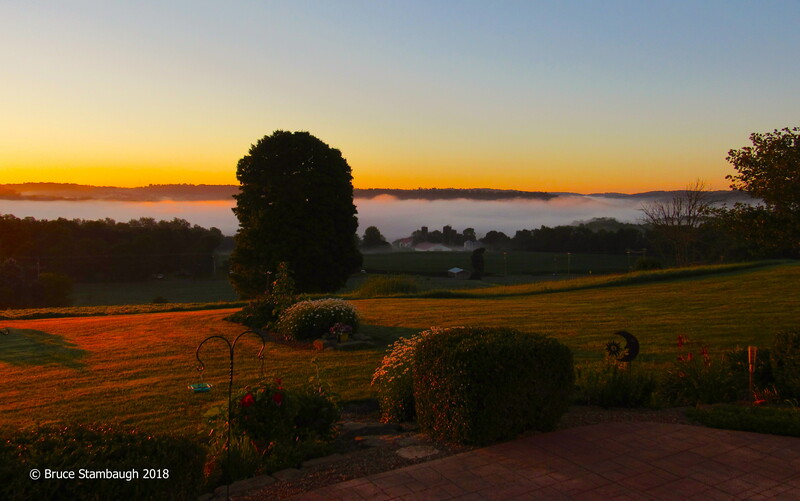 Moving to Virginia’s Shenandoah Valley has lessened some of the sting and bland of winter. We tend to have more sunny and warmer days than we did in Ohio. When it does snow, the aesthetic results are still the same. However, the white stuff doesn’t last as long. Winter’s radiant sunshine enhances any locale just as it can brighten all human spirits. January can be lackluster if you let it. Just look a little harder for any hint of color wherever you live. Like many TV commercial disclaimers, your results may vary. 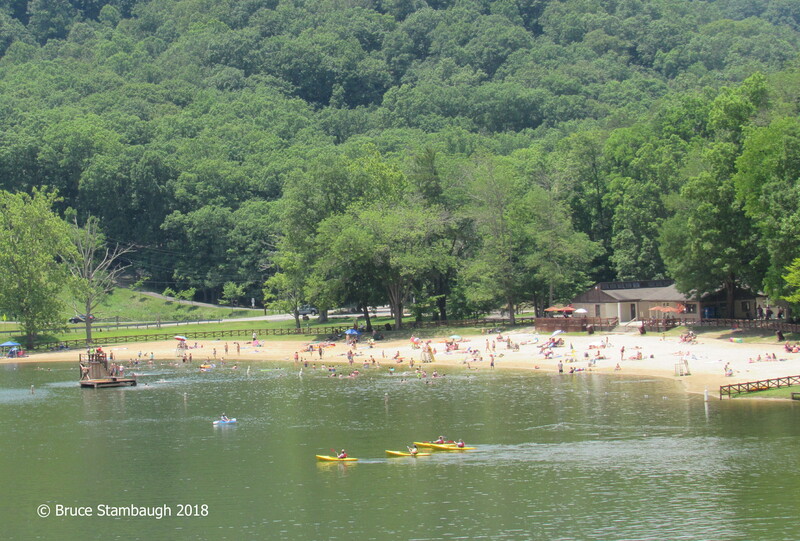 Last year at this time we were still settling into new surroundings, situations, and holiday opportunities as our relocation process to Virginia’s magical Shenandoah Valley continued. We had moved there to be close to our grandchildren. Celebrating the joyous season with them was paramount. But this year was different. With Thanksgiving as early as it could be, we found an opening in our busy retirement schedules to return to our Ohio homeland. An early winter snowstorm surprised us as we traversed roads in the higher elevations of West Virginia and Maryland. That couldn’t deter us, however. We arrived safely in the Buckeye State to celebrate personally with a few family members and friends, people we love and cherish. Some gatherings were planned while others were serendipitous. The frivolity began before we could even unpack our suitcases. That’s the kind of company we keep, and that is willing to host us. Our first evening meal and lively conversation with lots of laughter set the tone for our all too brief visit. We had so much fun we could have turned around and gone straight back to Virginia and been pleased with the trip. Of course, we didn’t. The next morning we met old friends at a busy locally-owned bistro for breakfast. We discovered other friends there, too. We stayed so long it would have been more profitable if the proprietor had charged us per hour rather than per meal. As we left for old haunts near Holmes County’s Mt. Hope, the van mysteriously pulled into the parking lot of a favorite chocolate shop. Affabile store owner Jason must sweeten his candy with his hospitality. We made a beeline to the furniture store where I served as its chief marketer for 11 years in Mt. Hope to say hello to former fellow staff members. Fond hellos, fun memories, and new looks for the store inside and out greeted us. Their ability to create the latest styles in beautiful furniture boggles my mind. After that enlightening encounter, we took a break at the charming Red Mug Coffee shop, an apt name if there ever was one. Of course, I drank my delicious brew from a red mug. We hadn’t even ordered when a former student entered. Lonnie and our family go way back. He was born two hours before our daughter. Their cribs were side by side in the nursery at the hospital in Millersburg. Then a high school friend of our son spied us and years of catching up ensued. Marlin proudly shared photos of his adopted children. Those kids couldn’t be in a more loving situation. Laundry on the washline told us that Martha was home. After warm, welcoming hugs, we visited with her and her youngest child until we just had to leave. Our timing couldn’t have been better. I stopped to visit briefly with my friend Dan, who mows the roadsides in the township where I served as a trustee for 20 years. We found our former across-the-road neighbors Paul and Mary as gracious and hospitable as ever. The time ticked away here much too quickly as well. The visiting continued at Killbuck with the doctor who brought our daughter and son into this world. As always, his spry wife considered us family. We checked in with a couple of their children and spouses, too. Of course, “children” is a relative term since they all are grandparents. The pace of our last day in Ohio was just the opposite. Neva went shopping with her sister, and sure enough, met even more friends. I ran some necessary errands before going birding. 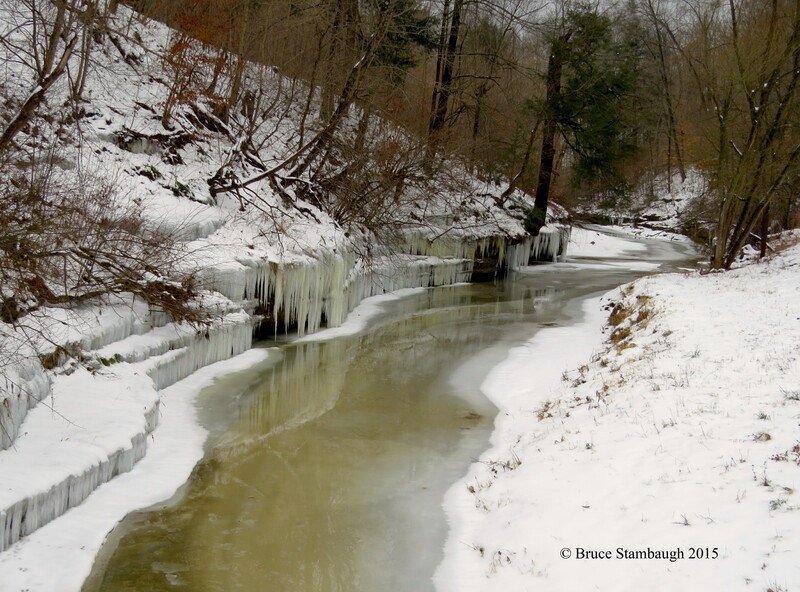 I was thankful for the exercise, the wildlife I encountered, and many photo opportunities. The sun finally burned through the haze by late afternoon. Still, the air’s temperature couldn’t come close to matching the warmth of fellowship we had experienced. Holidays are for gathering, reminiscing, sharing. Through both our planned and spontaneous encounters, it was indeed a joy to be home for the holidays. A young buck white-tailed deer bounded across the trail far ahead of me. Click the photo to enlarge it. A river ran through it. Memories often materialize in the most unusual of circumstances. It was early June, and we had endured rainstorm after rainstorm. At times, the rain pelted down at the rate of two inches an hour. When you live between two mountain ranges and groundwater has already saturated the sticky, red-clay soil, that much precipitation spells trouble. 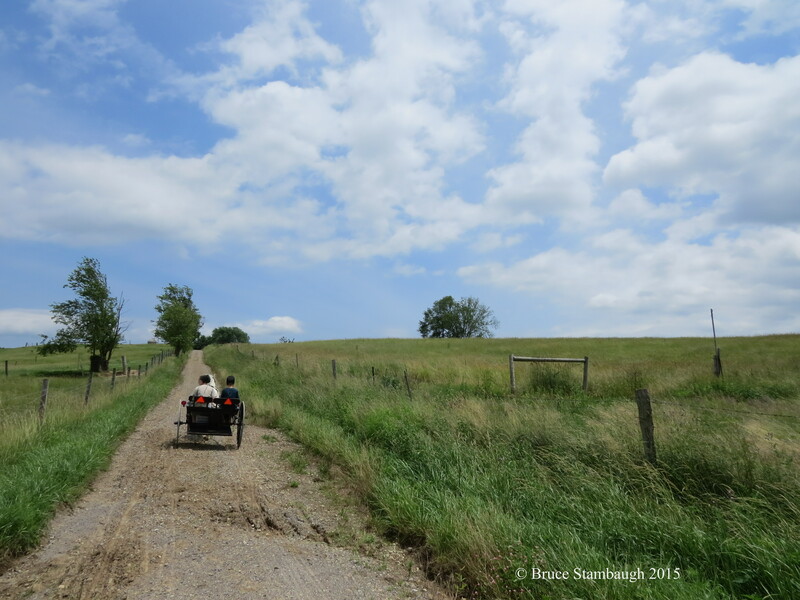 And trouble found lots of folks throughout the picturesque Shenandoah Valley. High water flooded roadways, keeping fire departments and rescue squads busy with multiple water rescues. It was still pouring when a river of muddy water rushed through our backyard. I decided to check the five-foot crawl space beneath our ranch home. I slipped on my old black gumboots and jumped into eight inches of water. Instantly, cold, yucky water surrounded my right foot. The combination of old age and wear and tear had finally taken their toll on my versatile rubber boots. I was grateful a local plumber was gracious enough to bail us out despite being swamped with other calls. Everything beneath our home seemed to have weathered the storm except my precious boots. Gumboots are knee-high footwear made of rubber and fabric designed for all kinds of outdoor activities. Those boots and I went way back. They had served me well in a variety of conditions over several years. I remember where I bought them nearly three decades ago at a now-defunct shoe store in Mt. Hope, Ohio. I wore the boots often in many different situations. I had depended on them time and again, often in dire instances. When a storm hit, I put them on to check my roads as a township trustee. 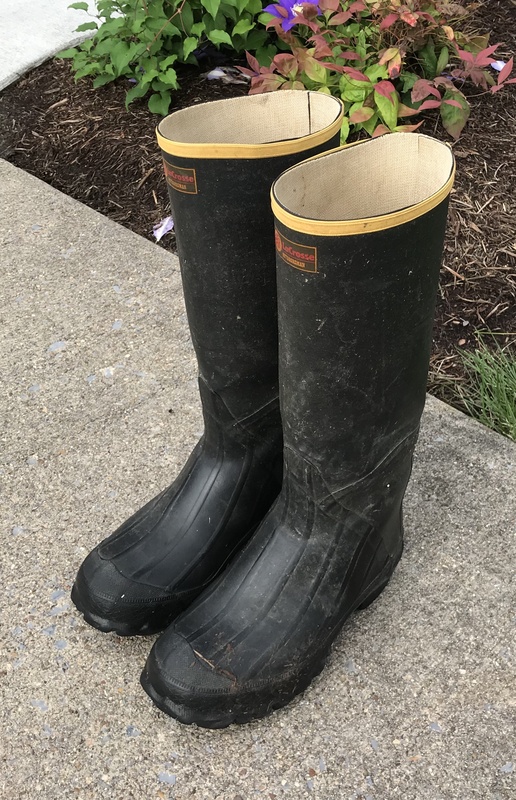 I can’t tell you how many flooded streets and ditches I waded through wearing those boots. I traipsed through many snowstorms with them, too. Once after a big snow, I spied a grizzled old opossum munching birdseed from a feeder that sat atop a picnic table in our backyard. On went my coveralls and those gumboots. I intended to shoo off the unwanted mammal. As I opened the door, our pet rat terrier Bill shot out the door ahead of me. Bill’s fearless instincts immediately kicked in when he spotted the opossum. The little dog circled the unimpressed marsupial once, and on his second pass, Bill leaped for the much larger animal’s tail. The opossum hit the ground with a thud, dead on arrival. Those boots even helped me as a volunteer firefighter and EMT. On one run, I found myself standing in the shallows of a stream holding up an elderly victim who had fallen into the rushing creek. I still remember the fire chief’s surprised expression when he saw me in the water with those black boots. Another time, on an early subzero February morning, I spotted our Amish neighbor heading across frozen farm fields toward our house. Levi was delivering the promised fertilizer for our garden. Steam shimmered in the morning light as it rose from the hardworking draft horses and the load of manure they were pulling in the spreader. Like I said, sometimes the strangest circumstances stir the fondest memories. Our Ohio backyard winter scene. The prairie on the hill. 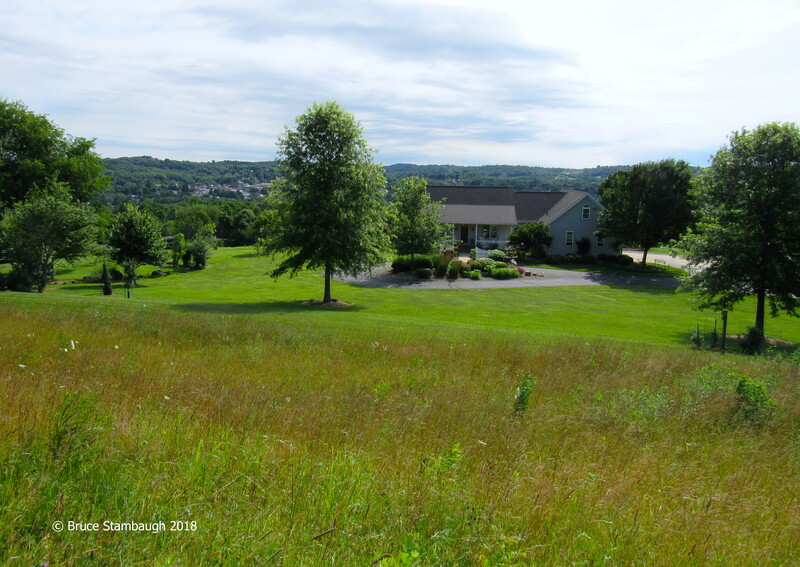 Several years ago, our lifetime friends Dave and Kate built their dream house on a hill overlooking Millersburg, Ohio. They picked the perfect spot. From that lofty vantage point overlooking a lovely valley, Dave and Kate can see the county courthouse clock tower, the school where they both taught, and the hospital where their children were born. The setting is marvelous, the view fantastic. Still, through hard work and creativity, the couple has managed to improve their surroundings, not only for themselves but for the wild things, too. About five years ago, Dave decided to turn work into play so to speak. 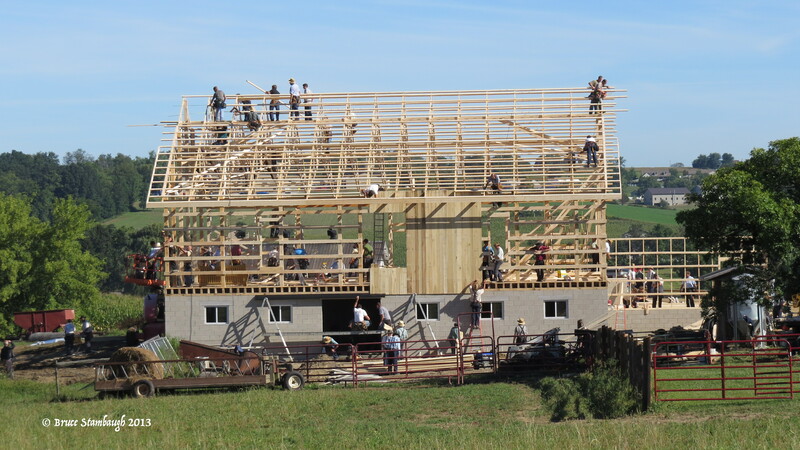 He kicked the cows out of the five-acre, pastured hillside that surrounded the house. His goal was simply to let nature take her course. Before the European invasion 300 years ago, a dense, mature forest covered most of what is now Ohio. Dave wanted to test an old theory that the land would replenish itself if allowed to go fallow. So instead of cows grazing, grasses, plants, and seedlings began to sprout freely. Today, the results are impressive, producing rewards that even the amiable couple could never have imagined. On an all-too-brief return to our Ohio haunts, Dave led me on a walking tour of his mostly-spontaneous prairie. We traversed a looping pattern of mown paths that crisscrossed the rolling hillside topography. Up and down and around we walked. All the while Dave pointed out some of the changes that had already naturally occurred. 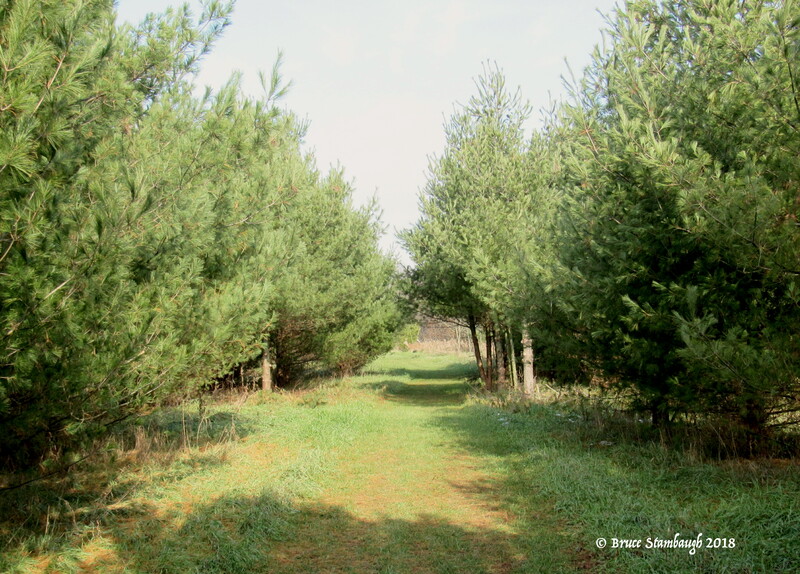 In some spots, he had helped things along with saplings and young trees he had planted. He checked on them like a mother hen guarding her chicks. Of course, he encaged the plantings with wire mesh to stymie the ubiquitous and free-ranging deer that nibble the tender and tasty leaves and stalks. Sometimes it worked. Wildflowers and plants now flourished in the prairie plots where heifers used to munch. The floral growth attracted appreciative pollinators that flitted and buzzed about while we ambled along. Bees and butterflies, flies, dragonflies, and damselflies all made appearances. 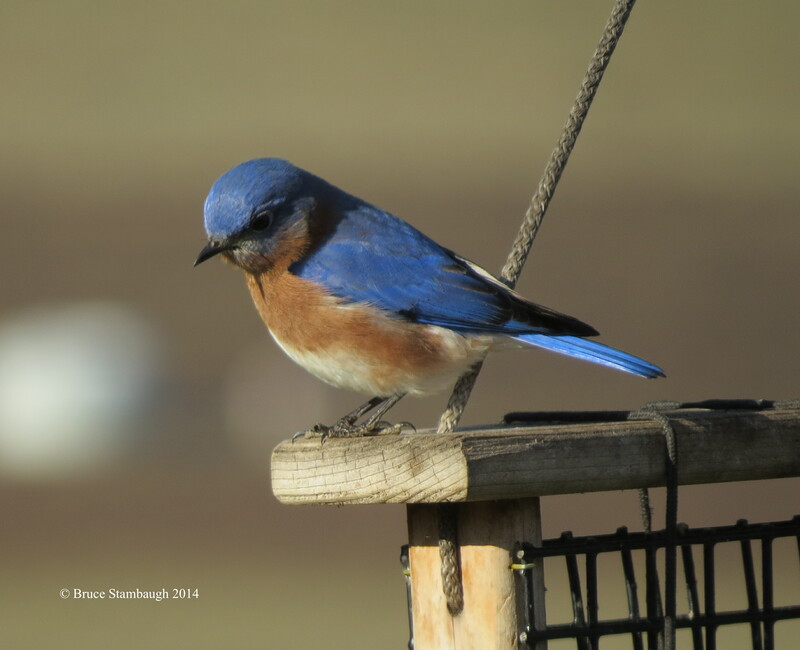 Several pairs of eastern bluebirds tended to their nests in boxes Dave had erected. Some had eggs, some second brood hatchlings. Others were empty. 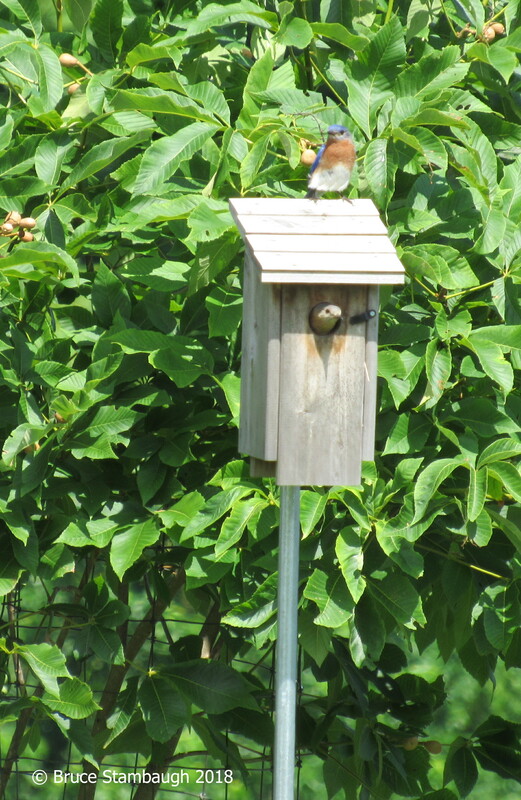 When we cleaned out an old nest from one birdhouse, a bluebird pair began building anew a short time later. Dave’s face glowed. 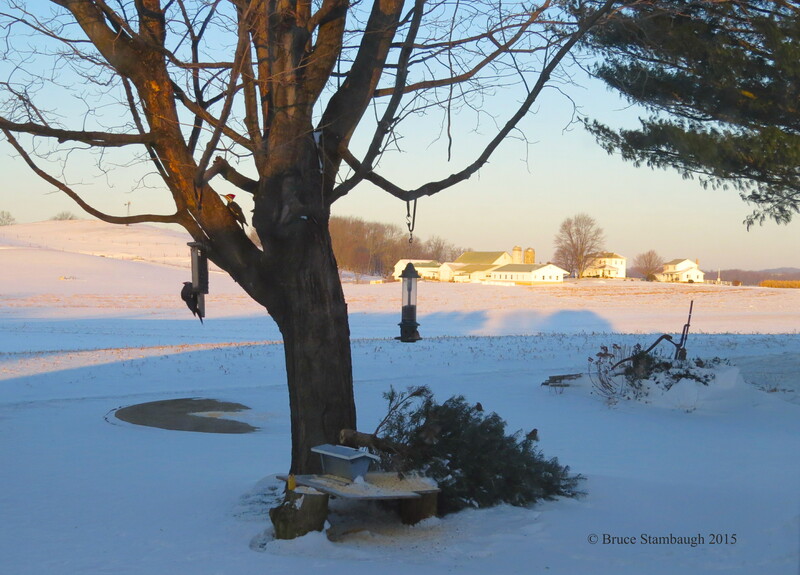 At the bird feeders, Ohio’s smallest to largest woodpeckers and several species in between vied for the suet offerings. Both pileated and red-bellied even brought their young to learn to forage for the protein. On the parameters of the property, red-tailed hawks dove from shaded oak perches, unsuccessful in snagging a mammal breakfast. An indigo bunting began its song but stopped short, a typical behavior this late in the summer. Cedar waxwings preened in the morning sunshine on dead ash snags. American goldfinches harvested thistledown for their late-season nests. The gnarled, amber trunks of giant Osage orange trees served as living statuaries in the young reclaimed landscape. Their coarse-skin fruit hung lime-green and eerie, like so many Martian brains. Once dormancy dominates the prairie, Dave will mow down this marvelous and necessary wildlife habitat to eliminate the human-made nuisance multi-flowered rose bushes. Of course, he’ll save the trees, both those he planted and the multitude of volunteers that are thriving. That adage is coming true. Left to grow on its own, this come-what-may former pasture is an ever-changing habitat for all things bright and beautiful. The environmentally friendly owners couldn’t be more grateful. With all of its positive and pleasant attributes, summer makes it hard to be humble. We all want to get out and take full advantage of the sunny days filled with warmer temperatures and a wide variety of activities. We fling ourselves full force into each day whether it’s for work or for play. We want to drink in every drop of sunshine, warmth, and blue skies, from dawn to dusk. Toddlers, children, and teens fill the local swimming pools, both public and backyard venues, while adults keep watchful eyes on the less careful youth. Construction workers bask in the fair weather, narrowing four lanes to one with an arsenal of orange barrels. Lawnmowers hum morning, noon, and evening throughout global neighborhoods. Contractors and excavators work sunup to sundown. 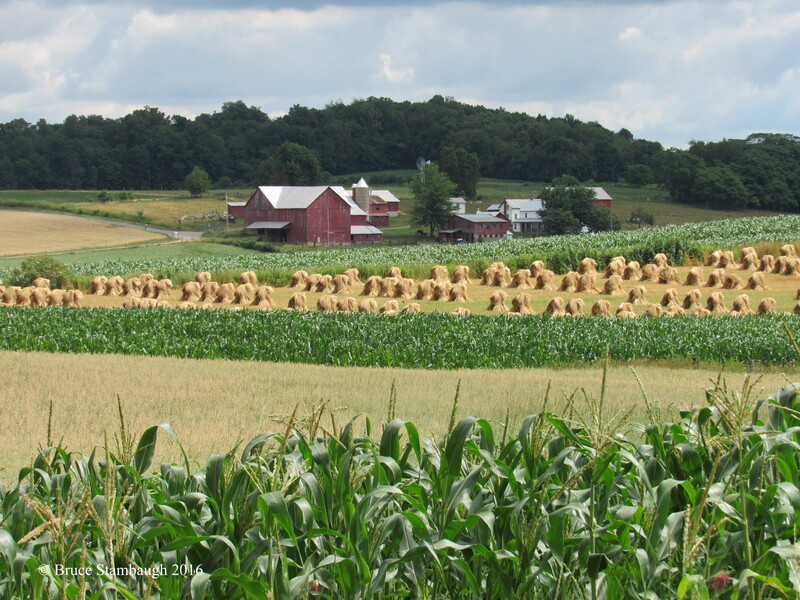 Farmers are in their glory, beginning to harvest the fruits of their labor. In many places, the corn reached far beyond knee-high-by-the-Fourth-of-July standards. In others, stalks stood only inches tall, drowned out by the super wet spring and early summer rains. 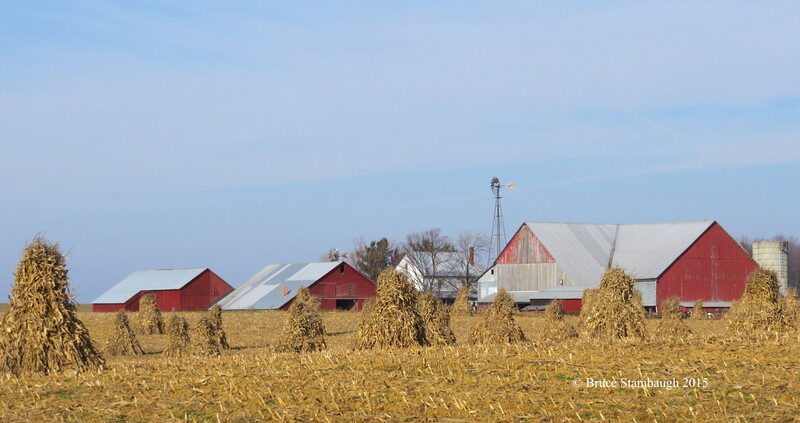 Amber waves of grain really did roll in the wind until giant combines gobbled them up or they formed rows of shocks like so many soldiers standing guard in Amish-owned fields. Summer, however, has other, more drastic ways to get our attention with her weapons. Summer can humble us lowly humans in many ways. Think floods, wildfires, tornadoes, droughts, golf ball-sized hail, record heat and humidity. No matter our stature or station in life, we all succumb to those prevailing conditions. Summer humbles us. For those unfamiliar with E.B. White’s beloved children’s classic “Charlotte’s Web,” humility played a major role in the book’s plot and dialogue. The spider Charlotte wove “Humble” into the web that served to save the life of the precocious pig Wilbur. She wanted a word that meant “not proud” as Wilbur’s crowning characteristic. But humility has a second meaning beyond the social one. 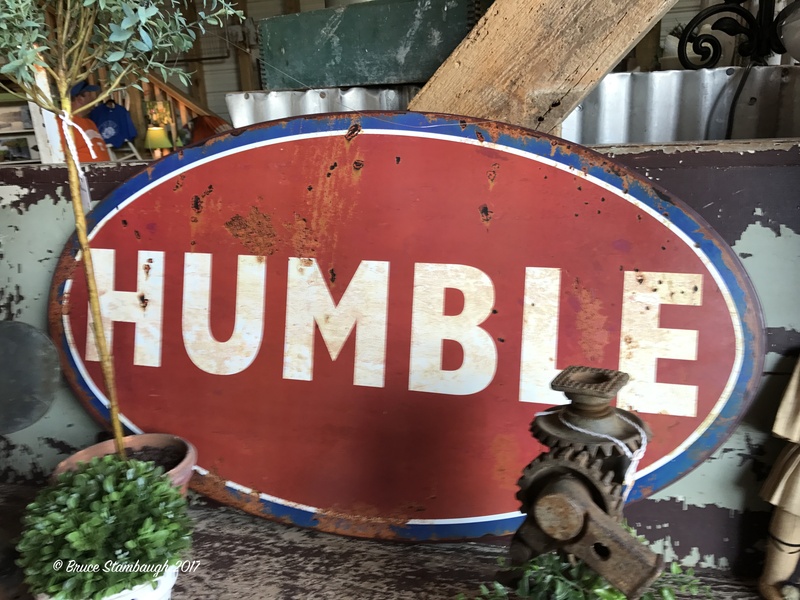 Humble implies a willingness to learn, and thankfully summer has much to teach us. The lessons are all around us in a more pleasing, useful, and beautiful form than what disasters wrought. Vegetable gardens and truck patches team with all sorts of goodies that nurture us. Tasty homegrown sweet corn, luscious red tomatoes, green, red, and yellow peppers, and tangles of zucchini are just a few examples. Roadside produce stands and supermarkets tempt us with juicy peaches and vine-ripened melons. Generations ago indigenous Americans taught us to plant, tend, and harvest these marvels. For those non-gardeners among us, we sniff and thump and feel and taste to select the best of the bunch like our parents and grandparents did. The poor fruits and veggies pay the ultimate price. Please click on the photos to enlarge them. Flower gardens are peaking with hollyhocks and zinnias and cultivated flowers, too. Leafy hardwoods provide shade and refreshing coolness from the oppressive summer heat for humans and critters alike. Wildflowers and wildlife, too, show their stuff. Dainty spotted fawns venture out on their own while mom watches from more secluded spaces. Parent bluebirds and house wrens ferry insects, worms, and berries to their youngsters nearly as big as the adult birds. Families crowd beaches and climb mountains on vacations, exploring new venues or returning to old haunts discovered by previous generations. Where is humility in all of this? Using the educational definition, it’s merely a reminder of the responsibility of the created to care for the creation. That is about as humbled as we can get. Memorial Day has come and gone. You know what that means? It’s the traditional but unofficial start to summer in the United States. Public swimming pools will open to the sounds of laughter and joyous splashing by youngsters fresh out of school. They are the envy of those still laboring over mandated tests and counting the days until they, too, can roam free. Church camps and scout camps and Bible schools will open their floodgates and let the children pour in. Snipe hunts and dreaded memorizations will commence just to get to the real treasures, homemade snacks. The warning chirps of robins disturbed from their nests resound until inattentive humans continue on their way. The first broods of fledglings squawk and beg for their parents to feed them despite being nearly as big. If a brown-headed cowbird has snuck into a song sparrow’s nest, the scene can be grotesque. Lawn mowers, riding mowers, weed eaters, and leaf blowers join the summer society’s songfest, mostly off key. Those willing and able to expend the energy on their hands and knees for hours at a time do less intrusive weeding. Their rewards come in more than tidy flowerbeds. They enjoy the bees and butterflies flitting from bloom to bloom. 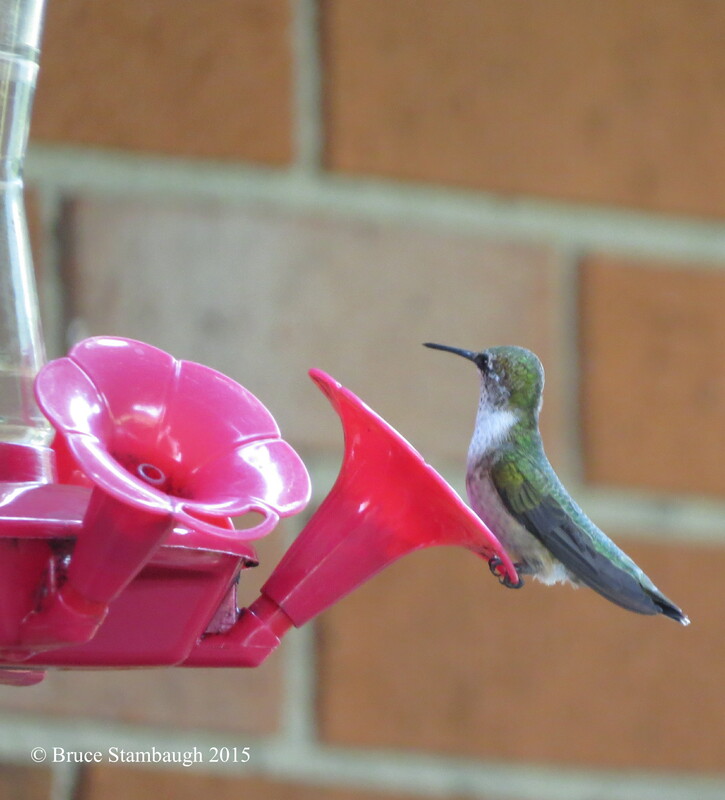 Ruby-throated hummingbirds zip from flower to flower, too. They supplement their diet with long sips at the local sugar water fountain to the delight of dedicated bird watchers everywhere. Many times the best show is when the tiny birds chase one another high and low, zigzagging at light speed after one another even though there are plenty of places to perch and feed. Those in charge of refilling the feeders applaud the performances. At night, the summer breezes diminish. Fireflies rise up out of the grasses and fields and light up the evening skies blinking their romantic messages. Overhead, commercial jets sail beneath the stars and planets that twinkle brightly. On the horizon, faint yellow flashes children like to label heat lightning interrupt the nighttime play. In reality, storms a hundred miles away had already driven other children indoors long before dark. The next day, the sunrise blazed crimson and orange, signaling a fabled warning to sailors and civilians alike that rain was on its way. Sure enough, a squall line raced through, bending trees to the stress point. A few sacrificed a limb to save the whole. Lightning flashed and crashed, and hailstones pelted the ripening strawberries to the dismay of both growers and customers. 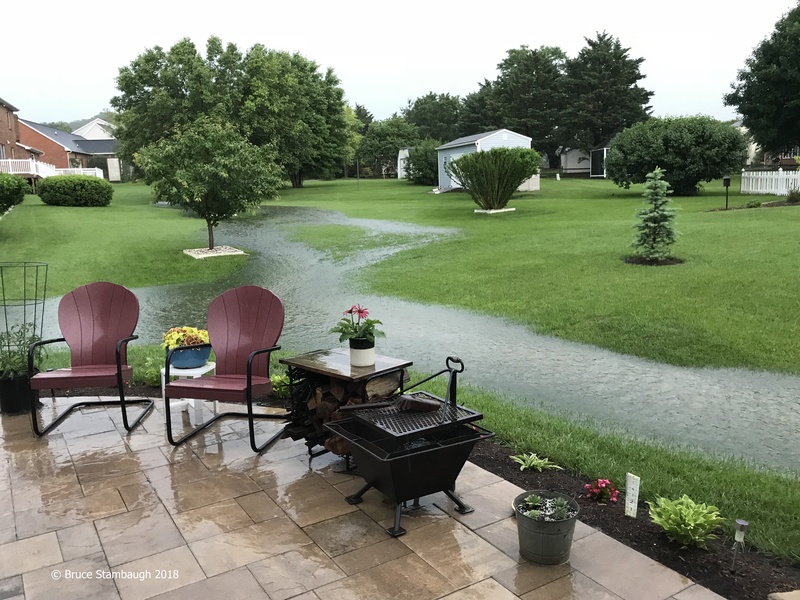 In suburbs and cities, torrents rutted gardens and sump pumps ran overtime. Those were minor issued compared to the storms that others endure. All of this romanticizing and reminiscing about summer pales in comparison to those whose nights are peppered with gunshots and emergency sirens. Summer in the city is filled with garden plots, swimming pools, day camps, and library readathons, too. Picnics in the park and taking in a baseball game, Major League or Little League, are also part of the warm weather entertainment. 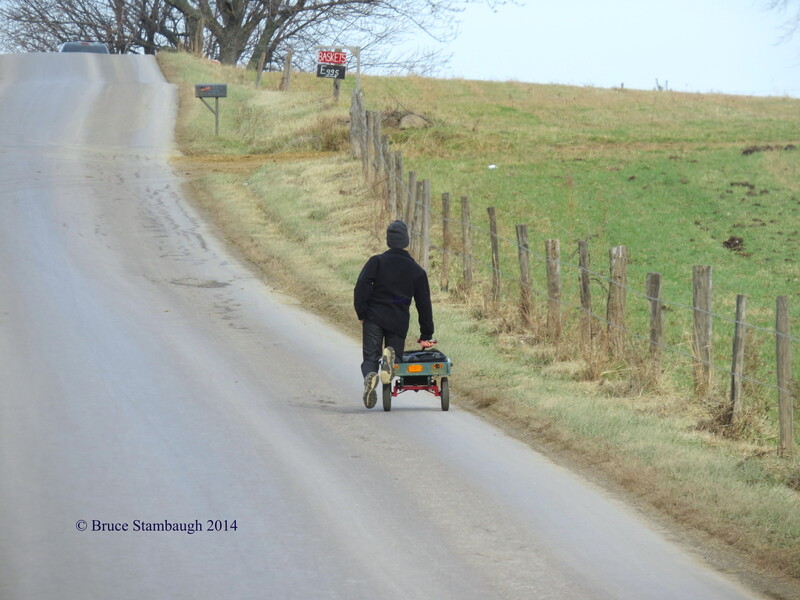 Bicycling along picturesque country roads or designated bike paths hits its peak. Helmets are always a safety requirement. Isn’t everything merely a matter of perspective and geography and circumstances? We still have nearly three weeks until the summer solstice, the scientific start of fun in the sun. It’s also the day with the most daylight, giving us plenty of opportunities to enjoy the sights and sounds of summer yet to come. Old Order Mennonite horses and buggies. My Virginia office where I write is similar to my former Ohio office. Both were converted bedrooms right across the hall from our master bedroom. Just like Ohio, my desk is right in front of a big window where I can look out onto and into the world for inspiration. Being an easily distracted person, I actually enjoy being diverted from my writing by life’s everyday interactions that I see. I find the digressions to be intriguing rather than agitating. Right outside my Ohio office. Life’s noises, of course, filtered in, too. Contrary to what you might think, sounds stirred me as well. The resonances I hear always have, do and will captivate me. Similarities abound between the Virginia and Ohio settings. In Ohio, I loved the soothing sound of horseshoes clopping along against the hard macadam of County Road 201. 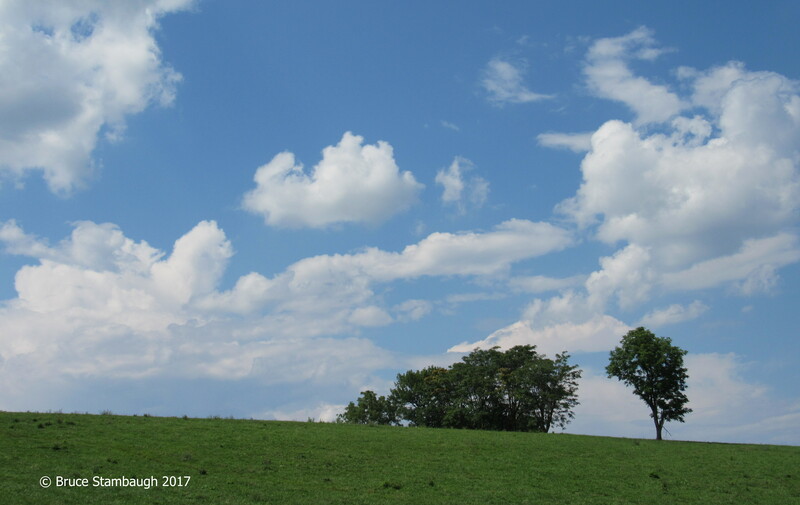 On unusually quiet, warm days with the windows flung open, I could hear the rhythmical clack, clack, clack of the buggy horse’s cadence coming from a quarter mile away or more. My wife and I both recognized how fortunate we were to hear that sound so regularly. Often we heard families talking or singing or sometimes occasional boom boxes blaring. Teenagers will be teenagers no matter their culture. I miss that element of living among the Amish. 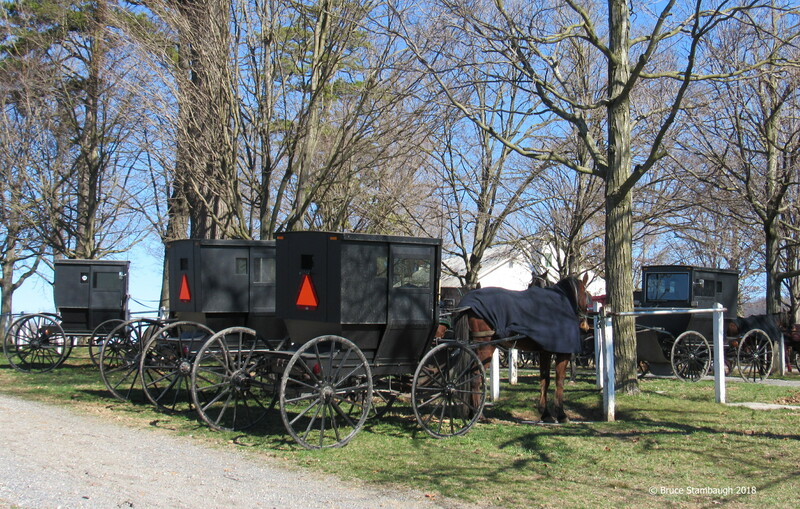 Though Old Order Mennonite farms are close by our Virginia home, I’ve never seen or heard one of their buggies on our suburban neighborhood street. Semis rumble down CR 201. I always said that our Ohio home was built on the Berlin-Wooster expressway. County Road 201 served as the chief artery between those two locales. It made easy access to both places, especially for semi-trucks. That was one sound I despised. I loathed their use of jake brakes heading north down Number 10 hill, a ski slope-like descent. The obnoxious clatter frightened birds, bikers, and four-legged animals and woke me up, often at 3 a.m.
We don’t have that problem now. Every now and then a large delivery truck cruises past the house. It’s the exception, not the rule. Most passers-by are bikers, walkers, and leashed canines. 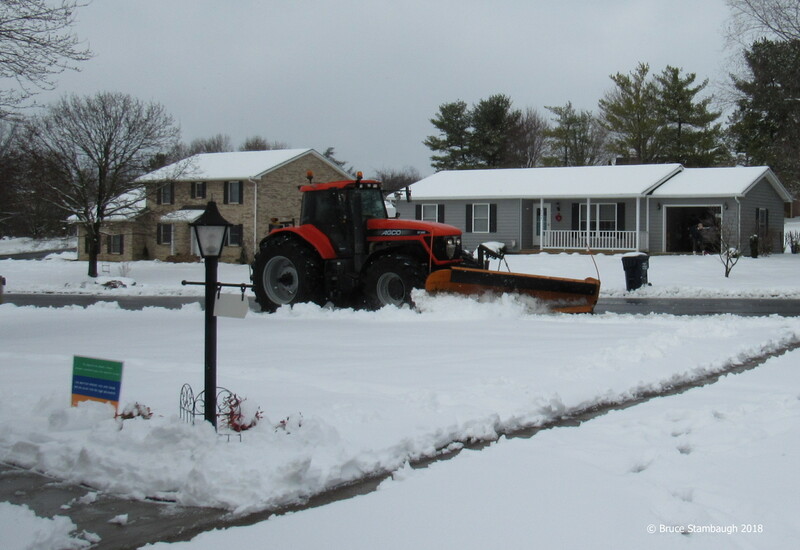 A mechanical sound I did enjoy during Ohio winters was the county snowplows clearing the road of the latest snowfall. They always did a marvelous job. One year they knocked down our mailbox three times in the space of two weeks. In Virginia, it doesn’t snow enough for the state to invest in snowplow equipment for secondary highways. Instead, they contract local farmers to clear the roads with big plows on large tractors. If I hadn’t been out shoveling myself, I would have never heard them. The snow seemed to muffle their diesel engines. Sounds that reach my office aren’t always external. 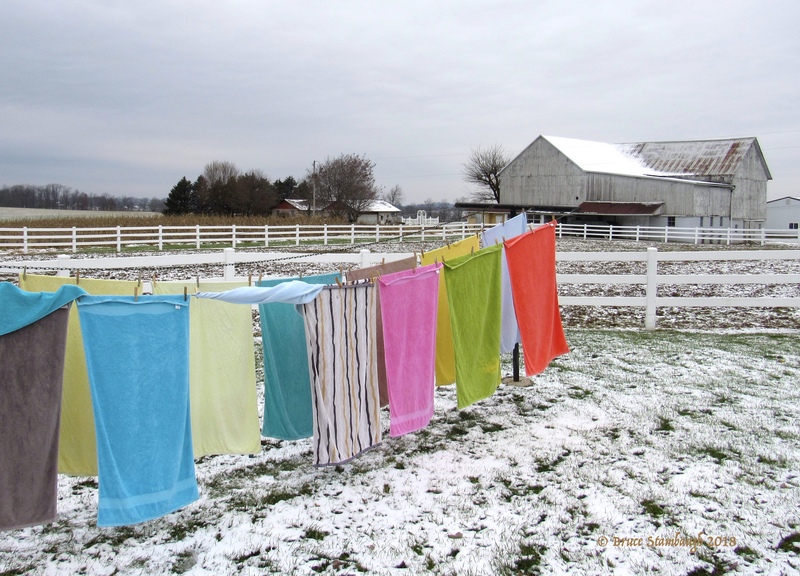 In Virginia, I can easily hear the washing machine thumping and the clothes dryer spinning, buttons and zippers clinking against the tumbling metal drum even though the laundry room is at the opposite end of our ranch home. Remembering to go empty the machines is another story altogether. Our Ohio home was a bi-level. My office was upstairs, the washer and dryer were downstairs. I seldom heard the cycle-completed buzzers. At least that was my excuse. I still hear children playing, dogs barking, birds singing, jets sailing overhead, sirens whaling in the distance. Those are universal sounds that are part of the human condition. It’s been a year since we moved to Virginia. The similar reassuring sounds of life in the Commonwealth mimic those of the Buckeye State. Those are sounds I can live with anywhere. 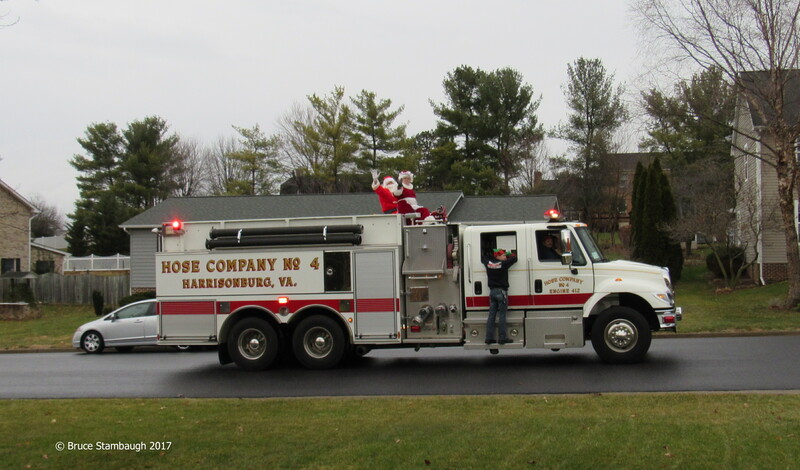 Even Santa and Mrs. Claus rolled by our Virginia home. 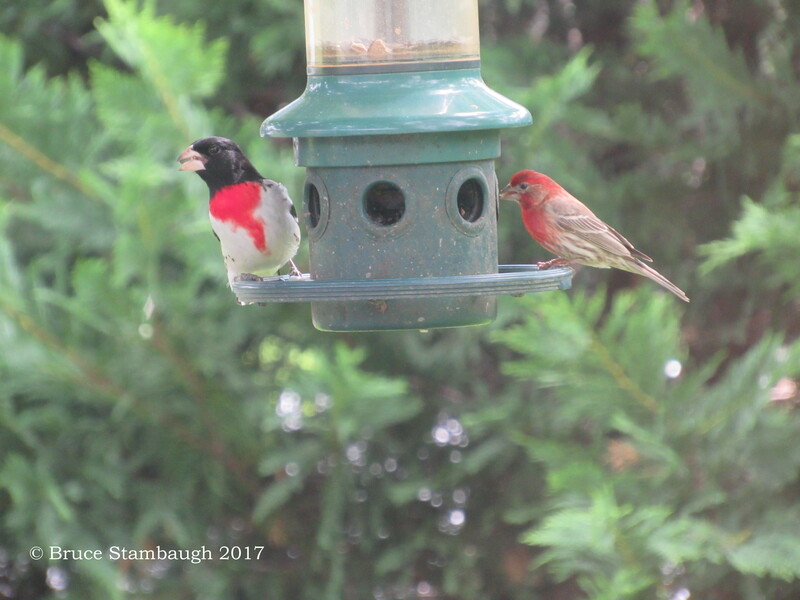 Male Rose-breasted Grosbeak and Male House Finch. I had high hopes for attracting backyard birds to our Virginia home. I hung feeders from the two maple trees on our property almost as soon as the movers had unloaded our household goods from the moving trucks nearly a year ago. Well, maybe it wasn’t that quick, but still, the feeders went up, one in the front yard and one in the back. I also erected a jelly feeder for the Baltimore Orioles and a sugar water feeder for the ruby-throated hummingbirds. 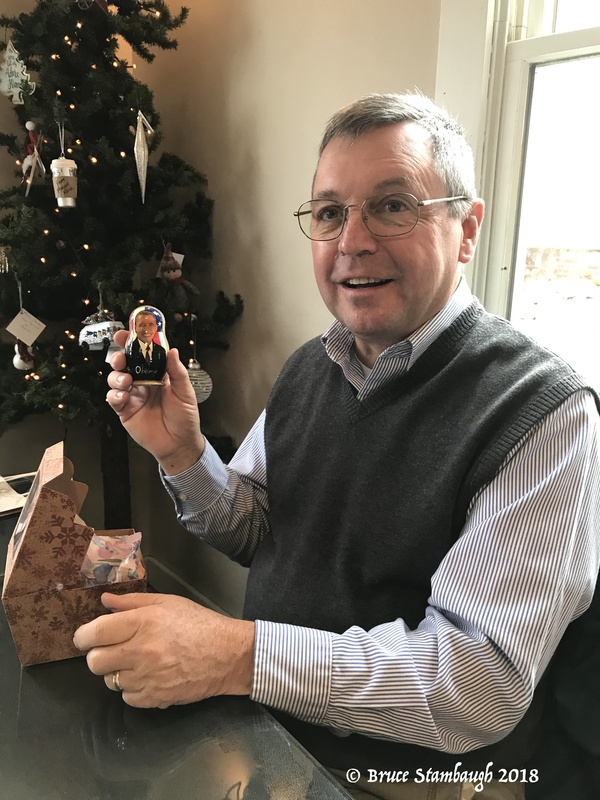 I was excited about starting our retirement years anew in Virginia. The grandkids were paramount in deciding to relocate. Birding came a little farther down the priority list. Still, I wanted to see just what birds I would attract. To my surprise, it didn’t take very long for some prized yard birds to appear. Northern cardinals, rose-breasted grosbeaks, American goldfinches and other species found the feeders right away. Tufted titmice, and black-capped and Carolina chickadees made occasional appearances, too. I was ecstatic. Male Downy and Male Pileated Woodpeckers. The results nevertheless were mixed. The numbers and species, however, were much fewer than what I had seen in Ohio. Back in the Buckeye State, orioles gulped grape jelly by the jarful. Hummingbirds zipped to my feeder by the kitchen window. At least seven woodpecker species visited my feeders, including pileated woodpeckers that brought their young to gorge on peanut butter suet. Songbirds were abundant and frequent visitors, too. Showy white-crowned sparrows were favorites. I especially enjoyed the eastern bluebirds. They brightened any dull Ohio day with both their brilliant springtime feathers and their sweet lullaby calls. 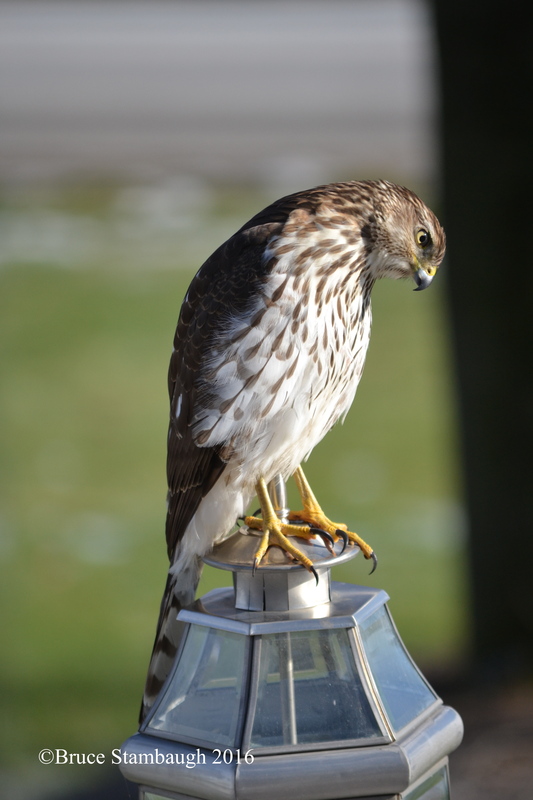 In Virginia, daily drama cropped up around the bird feeders. Large, bossy, and noisy common grackles consistently scared the more desirable species away. They also drained the feeders once they brought their young. In addition, scores of squirrels munched their way through the feed they could reach. The more sought-after birds didn’t have a chance, so I took the feeders down for the summer. In Ohio, I fed the birds year-round. I rehung the feeders in the fall. 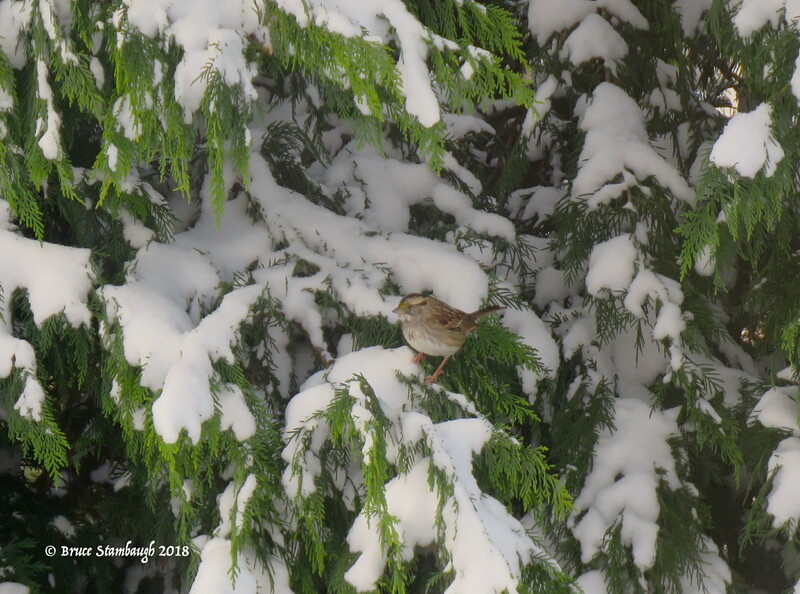 With the pest birds elsewhere, the better backyard birds returned. I was happy for that, and even more pleased when the dark-eyed juncos and white-throated sparrows arrived for the winter. It’s not that I expected Virginia to be Ohio. They were two different locales with entirely different habitats altogether. For bird watching, habitat is crucial. We no longer lived in a rural flyway like we did in Ohio. The habitat of our suburban neighborhood in no way remotely resembles the bird-inviting one we had in Ohio. It is also wholly unfair to compare one year in Virginia to a lifetime of appreciating Ohio birds. I photographed all the various birds I saw in Ohio. I have hundreds, perhaps thousands of digital shots. Reviewing them revives fond memories for me. But as much as I would like to, I can’t linger there. Now, I take pleasure in the natural springtime wakeup calls of the white-throated sparrows, song sparrows, and cardinals. I pay more attention to the gregarious American robins that I once took for granted. I chuckle at the effervescent northern mockingbirds that frequent our neighborhood. I miss those Ohio birds to be sure. However, the recent appearance of a migrating pine siskin sparked an epiphany. That little bird brought home a valuable life lesson for me that is apropos far beyond the birding world. Be happy with what you have. Where I feed the backyard birds.